Developing better interactions between citizens and government requires a human-centered approach to problem-solving. Often referred to as “Design Thinking,” the process itself focuses on the experience of the person — “the user” — needing to access a program or service. Gathering diverse perspectives about possible user experiences generates more, and ultimately, better ideas for transforming service delivery. And while intensive, the approach allows teams to work faster and test out their ideas in smaller venues, thereby making mistakes less expensive. 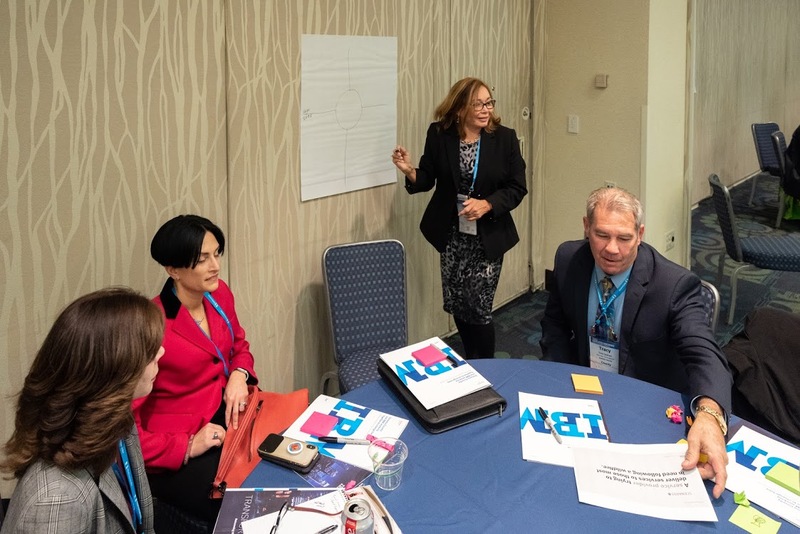 NACo turned to trusted corporate partner IBM to introduce Design Thinking during a two-part Smarter Counties workshop at the 2019 NACo Legislative Conference. While relevant to nearly any county program or service that interfaces with citizens, this high-level workshop introduced Design Thinking by presenting hypothetical situations drawn from Sonoma County, Calif.’s actual experiences helping its displaced citizens in the aftermath of the 2017 Sonoma Complex Fires. IBM’s Global Business Services Design Strategist Chris Magdelain and Global Design Lead Mark Stewart divided the workshop participants into teams and led those teams through a set of exercises designed to help them focus on the perspective of a hypothetical person facing a specific situation. First, teams had to predict the feelings, thoughts and reactions of someone confronted with a scenario similar to the Sonoma fires. For example, what might “Sarah,” a 24-year-old single woman, in her first job, living in an urban county and experiencing her first emergency, say, do, think or feel in that situation? After defining an array of possibilities, each team developed ideas about what she might need to address her concerns. Based on those needs, teams began to develop ideas of what “Sarah” would want to be enabled to do, identifying solutions through a growing understanding of her likely problems and challenges. “Design Thinking provided Sonoma County a roadmap to Access Sonoma, their rapid response solution, allowing them to better serve displaced residents, but also created a new model of operations, allowing them to see how Multi Discipline teams could empower caseworkers and the community through a more holistic approach to care,” said Mary-Sara Jones, Industry Leader, Health and Human Services, Global Business, Services, IBM. Diane Duff joined NACo in 2018 as the Director of Corporate Relations. In this position, she leads the effort to secure, build and sustain relationships between corporate leaders and county government decision-makers. Allan Angel, vice chair Telecommunications and Technology Committee and Kent County, Del. commissioner, relates his experience with poor cellphone service in his county. Photo by Denny Henry. Rep. Anna Eshoo (D-Calif.) introduced a bill that would effectively dismantle the Federal Communications Commission’s controversial September ruling on 5G siting that severely limited counties and other local governments. On January 14, Rep. Anna Eshoo (D-Calif.) introduced the Accelerating Wireless Broadband Development by Empowering Local Communities Act of 2019 (H.R. USDA Secretary Sonny Perdue addresses participants of the 2019 NACo Legislative Conference. Washington, DC (February 26, 2019) – The National Association of Counties (NACo), the Rural Community Assistance Partnership (RCAP) and Rural LISC (Local Initiatives Support Corporation) have partnered to address the critical need for affordable high-speed internet for rural communities across the country. NACo has partnered with the Local Initiatives Support Corporation (LISC) and the Rural Community Assistance Partnership (RCAP) to develop a mobile app designed to identify areas with low or no connectivity to help ensure adequate funding for broadband infrastructure is provided across the country.